Are you looking to dip your feet into email marketing? Email marketing is the best way to connect with your visitors, build an engaging relationship, and convert them into customers. Choosing the best email marketing service that has all the features you need is crucial for the success of your business. Each email marketing service has its own unique set of features, but there’s no reason to feel overwhelmed. We’ve got your back. In this article, we’ll compare the top email marketing services to help you pick the best email marketing service for your business. Do You Need Email Marketing? If you have a website that has traffic, then you need to do email marketing. Email marketing gives you the ability to contact your visitors even after they leave your website. Increase repeat visits: Over 70% of website visitors abandoning your website will never return. When you build an email list, you can build a connection with your visitors by collecting their email addresses and sending them valuable content. Build a loyal following: Repeat visitors are more likely to convert into customers, compared to first-time visitors. In fact, studies show that it takes 3-4 visits to your website for your potential customers to actually think of doing business with you. Increase sales: Email conversions outperform both social and organic search traffic. So if you’re looking to make sales, then you’ll need to start email marketing. Choosing the right email marketing service that fits your needs is important for your business. Just because an email marketing company is popular doesn’t always mean that it’s the best solution for your needs. It’s easy to get overwhelmed with different choices since there are dozens of email marketing solutions on the market. That’s why we’re going to break it all down for you! Ease of use: It’s important that the email marketing service you choose is easy to use and works with your business. Automation: Almost all services out there allow you to automate your email campaigns, but each one does it in a different way. Take a look at how different tools automate your campaigns and figure out if they help solve your needs. Industry: Some services are aimed at serving certain industries only. For example, ConvertKit was built specifically with publishers in mind. If that doesn’t describe you, then you’ll have to sign up for a service that better addresses your industry requirements. Pricing: Obviously, the tool you choose must fit your budget. With these things in mind, let’s compare some of the best email marketing services for your business. Constant Contact is the most popular email marketing service for small businesses. It comes with tons of customizable email templates that help you get a head start. When getting started, you’ll be prompted to choose your industry, and your previous experience with email marketing. Based on your selections, you’ll get customized content and promotion ideas that will help you level up your email marketing. Constant Contact offers unmatched support with live chat, emails, and discussion forums. They also have a vast library of resources. While most email marketing services offer 14 or 30-day free trials to test the service, Constant Contact gives you full access to their tools for 60 days. After the trial, the subscription starts at $20 per month for up to 500 subscribers. Constant Contact is best for smart businesses who’re just starting out with email marketing. Get started with Constant Contact today. SendinBlue is an email and SMS marketing software designed with simplicity in mind. Even an absolute beginner can easily start creating marketing campaigns without prior knowledge. Based on customer interaction, you can send transactional messages with reliable delivery. What sets SendinBlue apart from their competition is that their pricing is based on the number of emails you send. They offer a free account with unlimited contacts, but you can send only 9000 emails per month. You can buy SMS credits separately with no expiry date. The premium plan starts at $25 per month for up to 40,000 emails per month. SendinBlue is best for beginner marketers. Get started with SendinBlue today. You can customize your messages based on behaviors like cart abandonment, first-time users, returning website visitors, people who clicked a link on your site, etc. Their vast array of integrations let you send text messages, display Facebook ads, and much more based on your customer workflow. Drip offers a 14-day free trial. Their pricing starts at $49 per month up to 2500 subscribers. Drip is best for eCommerce websites and savvy internet marketers. Get started with Drip today. ConvertKit is the best email marketing tool for bloggers and publishers. It was built specifically for online creators like bloggers, podcasters, and YouTubers. With ConvertKit, you can create attractive forms and send custom-tailored emails to individual subscribers. ConvertKit also makes email automation easy to understand for publishers. For example, you can use their visual automation builder to create powerful automated email funnels that help you guide a visitor through a value journey. ConvertKit allows you to sign up for a free 14-day trial, so you can test the service without any commitments. The pricing starts at $29 per month for up to 1000 subscribers. ConvertKit is best for publishers. Get started with ConvertKit today. AWeber is one of the most popular lead generation services for small businesses. It comes with all the essential tools you need to grow your email list. You can design email newsletters with the drag and drop builder, automate email sequences, and create mobile-responsive signup forms that looks great on any device. Best of all, you can integrate AWeber with your WordPress website, landing page builder, or optin form builder with ease. Getting started with AWeber is easy. Just head over to AWeber’s website and sign up for a 30-day free trial. After signing up, you’ll get access to all their premium tools that help you grow your email list. Support options include live chat, phone, and ticket-based emails. The pricing starts at $19 per month for up to 500 subscribers. AWeber is best for all marketers in general, especially those who’re just getting started with email marketing. Get started with AWeber today. MailChimp is more than just an email marketing service provider. Besides email marketing, it comes with all the important features that let you convert your visitors into subscribers and customers. MailChimp’s features are powerful and affordable for marketers of all sizes, whether you’re a blogger, local business, or a company with off-the-charts growth. For example, you can create beautiful landing pages to convert your visitors into subscribers and paying customers. 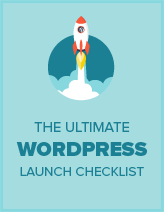 Connecting MailChimp to your WordPress website or eCommerce store is a breeze. You can also find hundreds of integrations with apps you already use. If you’re just starting out, you can sign up for their free plan up that allows you to grow up to 2,000 subscribers and 12,000 emails per month. As you grow, you can pay for more features for as little as $10 per month. MailChimp is best for marketing beginners and other users who want an all-in-one marketing suite at an affordable price. Get started with MailChimp today. GetResponse is an email marketing software that allows you to grow your email list with beautiful emails and high-converting signup forms. With their modern and beautiful user interface, getting your email newsletter campaign up and running is easy. Aside from email marketing, GetResponse is bundled with many online marketing features that help you grow your business. For example, you can create and host webinars on your site, build beautiful landing pages to turn visitors into customers, and more. Support is provided by phone, live chat, and email. GetResponse also publishes a lot of useful marketing resources such as courses, whitepapers, and videos that walk you through different aspects of email marketing. 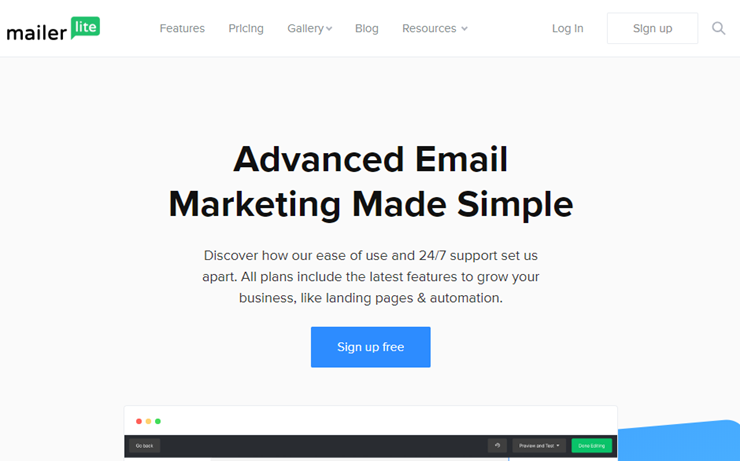 If you’re looking for an email marketing software that comes with beautiful and fast user interface, then GetResponse might be the right solution for you. If you want to give it a try, you can sign up for their 30-day free trial. Pricing starts at $15 per month. GetResponse is best for beginners and other marketers who also want a webinar marketing solution integrated with email marketing. Get started with GetResponse today. ActiveCampaign combines email marketing with CRM (Customer Relationship Management) and sales, so you can send personalized emails tailored to individual users’ behaviors. With ActiveCampaign, you can easily create eye-catching emails using their drag and drop builder. In addition, it even allows you to reach your subscribers on the go by sending SMS messages. The ability to track onsite events makes ActiveCampaign unique from other services. For example, you can track custom event calls from within mobile apps, billing apps and more. All your customer data will be organized in a sales CRM that gives you a complete picture of your customers. You can use this data to create highly effective marketing campaigns and followups. They make WordPress integration easy, and they also offer free expert migration service from other email marketing services to ActiveCampaign. ActiveCampaign offers a 14-day free trial to test the service. The pricing starts at $9 per month for up to 500 contacts. ActiveCampaign is best for marketers who want to level up their email marketing with a sales CRM. Get started with ActiveCampaign today. If you’re looking to build an email list on a tight budget, then you might want to consider MailerLite. MailerLite lets you grow your email list for free until you reach 1000 subscribers. They provide you with advanced technologies to attract your visitors and convert them into subscribers, such as landing page, popups and easy-to-use form builder. MailerLite is best for users who need a simple solution to grow their email list. If you’re on a tight budget, then we strongly recommend MailerLite. Get started with MailerLite today. If you have an eCommerce site where you want to personalize emails based on user behavior such as abandoned carts, first time users, return buyers, etc., then we recommend that you use Drip. They have an easy to use drip campaign funnel builder that allows you to trigger action-driven campaigns. If you are a professional blogger who wants to send automated emails that feel personal while increasing your engagement, then you should check out ConvertKit. It’s an email marketing service built specifically for bloggers and publishers. We hope this article helped you compare some of the best email marketing services and find the right one for your needs. If you enjoyed this article, you might also want to read 7 best WordPress lead generation plugins compared. I know it’s also impossible to know about the customer service on all the options listed above but I’ve been disappointed in ActiveCampaigns customer service. I have sent a couple emails and waited an hour on separate occasions to have someone on their chat get to my problem…only to have to “escalate it” and never hear anything back. If it was a small problem I wouldn’t care as much but this is about only half my list getting the emails. My company specializes in news and research for a niche audience. We send daily emails to paid subscribers, but have found that our marketing email platform does a poor job differentiating between marketing prospects and people who have paid to subscribe to our news. Our current emails lists are comprised 100% of paid subscribers, or people who have signed up for a 2-week trial. However, our email platform is suppressing emails to recipients it considers “unengaged” – that is, they haven’t opened an email for a while. That is fine for marketing emails, but this is a problem for our subscribers. All email services mentioned here can help you differentiate between paid subscribers and trial users thanks to segmentation. Each of them does in a different way though. You might want to talk to your existing email marketing provider on whether they let you classify different subscribers in your list. If you’re not satisfied with them, you can migrate your list to one of the services listed here. I cannot find the “Drip for free up to 100 subscribers” option. Can you please recheck. Seems like they retired the plan. We just updated the post. Thanks for letting us know about it. I have tried Benchmark Email and MailChimp and both of them are really good. Thanks for a great review. But I would add one more tool I’ve started to use since last year, Stripo.email. Could you please add Mail250 here too? Don’t do it. No support, no service, no clear instructions. Mail250 also gets a lot of flame reviews for the mailings landing in spam folders. Don’t waste your time. I normally don’t comment, but I just want to say thanks for making it easier for me to decide on which service/s to try out. This is precisely the information I’ve been looking for. Glad to be of help, Kate! Have you tried comparing ActiveTrail? I’m using it and before I choose it, I try to read a lot of comparisons, but I haven’t seen ActiveTrail that makes me think that AT is a good platform that’s why some of the platforms don’t want to compare with it, and I think I’m right cause base on my experience, this is the best platform that I was looking for. I appreciate your article. Thanking you for sharing such an informative blog. As we know, Email marketing methods play an important part in digital marketing services. digital marketing is the right forum where one can develop the business, brand, publicity, and many more. One more website you forget who provide email marketing service that is Freshemailsdaily, they furnish best services to every businessman. They helped me with my business. I wish you would also share the “cons” for each platform, for example, I have been using Mailchimp and I don’t like that I can’t send the same email to two different lists, sometime the information I share is important to more than one list. Also mailchimp doesn’t always get delivered to gmail accounts, seems like gmail sends mailchimp emails to spam folder or promotions… All my contacts with gmail have trouble getting my emails. MPZMail have been amazing for my business and have been going a while, don’t know how more people haven’t heard of them! What about iContact? They’ve been around a long time and are not on your list. I have been using “Mailconnect Email Marketing Platform” for 5 years, Great experience with this product! There are many great ESPs out there and everyone’s needs and use case are different. I’m in the media/publishing space and PostUp has been great for our business as it’s built specifically for media/publishing companies. Never heard of PostUp before. Thanks for the addition, Joe! Thanks, Shahzad for sharing the great information. Yes, Constant Contact is the popular email marketing service small business. IMO Autopitch is also one of the best email marketing automation software for the small & medium size business. Haven’t tried Autopitch yet, but it seems like that it’s built for a different purpose- effectively send cold emails. I think this could be a great option whenever I do email outreaching. Thanks for the addition to the list, Mary! Sendgrid is another excellent high volume email marketing service. We have been using them now for two-three years. Thanks for stopping by, John. We recommend Sendgrid as an email delivery app for any WordPress SMTP plugin. I’ve never tried their email marketing / automation services though. Thanks for sharing this article. This clearly defines every service and helps in deciding. It’s been a while since you’ve posted the comment. Anyway, thanks for letting us know about it. Just fixed it. If you are sending bulk email, Hotsol Email Marketing is a good service to send to unlimited subscribers. Thanks for stopping by, Andrew!